A refurbished Cedar Woman was unveiled on April 20. Artist Godfrey Stephens was on hand to talk about her history. The Weeping Cedar Woman made her long-awaited return to Tofino on Easter Weekend, after an extensive restoration led by the original artist, Godfrey Stephens. The five-metre tall carving was unveiled outside Tofino Community Hall on April 20 as part of the public celebration of the Tla-o-qui-aht Tribal Park Declaration. The visual impact is breathtaking. The female figure has twin cascades of tears flowing from her eyes and she is ornamented with a galaxy of images and designs. Her right hand is in a “Stop” gesture and her left hand points to the earth. Her glow comes from 500 pounds of copper sheathing that has been applied to surfaces such as the tear arches, according to the artist. Her spine is now reinforced with Portland cement and she is mounted on plate steel for added strength. Stephens was already a nationally known artist in 1984, when forest giant MacMillan Bloedel revealed its intentions to clearcut 90 per cent of Meares Island. Weeping Cedar Woman was his response to the crisis. When Stephens suggested a major figure carving, Joe Martin and his father advised they knew of a deadfall on Meares Island of the appropriate dimensions. But the logistics were simply too difficult, Stephens said. The totem was instead raised in Tofino, where it became a visible symbol of the struggle in Clayoquot Sound. The figure was transported, “with great difficulty,” to Stephens’ workshop in Victoria. The arms broke off in transit. Now refurbished, Weeping Cedar Woman is in need of a permanent home, somewhere in the Tofino area. Stephens said he would be very particular about the location. “It has to be placed in such a way that it doesn’t have sky behind it,” he said, explaining that it would not photograph properly if it were backlit, and would appear only in silhouette. Stephens credited Joe and Carl Martin, along with Mike Mullin and the Friends of Clayoquot Sound, for pressing to have the carving returned to Tofino. “They also brought in enough donations to allow me to hire someone to come in and help me do the work, because she was deteriorating,” he said. But Weeping Cedar Woman was not the only major totem figure carved in response to the impending clearcut operation on Meares Island in 1984. 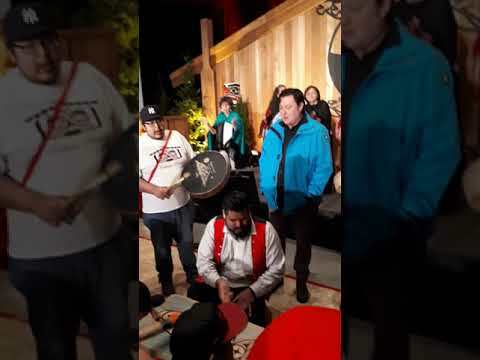 Tla-o-qui-aht artist Joe David told the Tofino gathering that he was out of town when word came about the threat from MacMillan Bloedel, and he was unsure of what he could do to help. Then he heard the history of the Cedar Man that stood on Meares Island from the late 18th century, from his late uncle, Dan David Sr, who was born in 1900. The elder recalled that there were visible remnants on the site as late as 1907, and his grandfather had actually seen the figure standing. The Cedar Man had held out one hand in a welcoming gesture, but one hand expressed caution. David said the parallel was obvious. Like the Weeping Cedar Woman project, Cedar Man was accomplished quickly, according to David. Steve Lawson helped locate a suitable log, and, helped by non-aboriginal carver Lorne White, Cedar Man was completed in 21 days. At that point, he said, there was a meeting of chiefs at Tin Wis. David and his colleagues raised the Cedar Man at the hotel. The next step was more audacious. David and a crew raised the Cedar Man in front of the Legislature in Victoria as part of a larger demonstration, and the piece was viewed by thousands of visitors. Unlike Weeping Cedar Woman, Cedar Man was not to languish in the elements. The figure subsequently travelled to Vancouver, where it has remained on display as a major feature at the University of BC Museum of Anthropology. David said he is currently in discussions with the museum about rededicating the piece.